The “dot com” lifestyle is becoming increasingly popular & everyday new people are looking to get involved in online marketing. Previously people have always been skeptical about the whole concept of making money online but now they’re begin to realise that not only is it possible but it’s actually quite easy to get involved in. If you’re going to succeed online then you NEED traffic, because traffic is the lifeblood of any online business. Without traffic you have no chance of acquiring leads, acquiring customers & making sales. However a lot of people actually struggle to get traffic, and I’d actually go as far as to say this is where 99% of marketers fail. The reason most marketers struggle to get traffic isn’t because it’s difficult, it’s simply because they’re taking the wrong approach. The truth is that generating truckloads of traffic is actually pretty easy – providing you take the right approach. 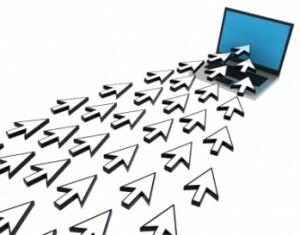 Generating traffic is all about creating “online real estate”, such as blog posts or videos just to name a few. It’s all about getting your offer “out there”. For example let’s say you upload 1 video to YouTube and on average it gets about 10 views per week. Out of those 10 views 2 people click the link in the description & visit your website. From doing this you’ve generated 2 visitors per week to your offer. Admittedly it’s not amazing, but it’s a start. So from here it’s just a case of scaling it up. Based on those exact same stats let’s say you went ahead & uploaded 4 more videos to your YouTube channel. With 5 videos in total you’d now be getting on average around 50 views per week, which would mean 10 people visiting your offer every single week. It still might not seem spectacular, but bearing in mind that a video would probably take around 10 minutes to record that means that from just 50 minutes work you’ve added 10 visitors every single week to your traffic totals. So what if you took 50 minutes out of every day for a month to add new videos to your YouTube channel? After 30 days you’d end up with 150 videos on your channel (30 * 5 = 150), and 150 videos would mean 1,500 views every week based on those same stats above. With that amount of views you’d be averaging around 300 new visitors to your offer every single week (again based on the same stats above). 300 new visitors every week, after just 1 month! Do it again for the next month & you’ll be pulling in 600 visitors per week, which is almost 100 per day. See, getting traffic is easy! What’s even better is that you can scale it up as much as you want. Rather than just uploading videos to YouTube publish them on several sites like DailyMotion & Vimeo for maximum exposure. Rather than creating videos start writing blog posts, but don’t just blog on the one blog create several, again for maximum exposure. Rather than restricting yourself to videos & blog posts start contributing on social media too, again for maximum exposure. All of these things I like to class as “online real estate”, and the more of it you have the more chance you have of somebody landing on it & heading over to your offer. When it comes to generating traffic it’s all about thinking about the long term. A small effort today such as creating a video might not instantly drive bucket loads of traffic but over the course of a year it could send hundreds of visitors to your offer, and out of those visitors several could have been buyers. You’re basically making a one-time small effort for a residual flow of traffic, so every additional effort you make is basically just going to scale things up and drive even more traffic. I find it best to set yourself a routine. Get in the habit of taking an hour or two out of your day to write a blog post, create a YouTube video & then share them on social media. If you’re consistent & you do it daily then you’ll find massive success online. The reason most people fail isn’t because it’s difficult, it’s simply because they lack consistency & give up without giving it time. The seeds you plant now you’ll harvest later. When it comes to generating traffic it couldn’t be more true. Successful people have a long term vision and they realise how the efforts that they make today will pay off later. Unsuccessful people quit because they can’t see past the short term… They don’t give it time. Look at the likes of John Chow, he’s one of the finest examples of consistency there is. He’s been blogging daily since 2005 & now he’s making hundreds of thousands of dollars every single month. The truth is, time flies & before you know it 5 years will have passed… If you put it off you’ll just look back in 5 years time & wish you started today. Because that’s exactly how I felt! When I realised the true power of blogging & creating content online I was gutted that I didn’t start sooner, but the second I realised I got involved & began building up my future. Here I am now 2 years later making a living from the internet! My advice to you right now would be to start making small efforts today and begin building a long term sustainable online traffic source. To begin with setup a blog, create a YouTube channel & sign up to some social media networks, then get yourself into a routine such as the one I’ve put together below. 1. Create a video, upload it to popular video sharing sites such as YouTube, Vimeo & Daily Motion (linking back to your offer!). 2. Write a blog post on the same topic as the video you’ve created & embed the video into the blog post (there’s plenty of places you can create a free blog without needing any technical experience to set one up). 3. Share the blog post on popular social media networks such as Facebook, Twitter, LinkedIn etc.